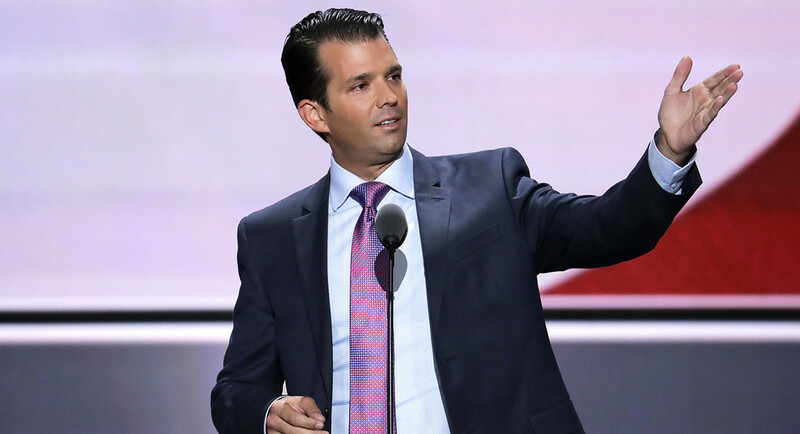 By John Kruzel on Tuesday, July 11th, 2017 at 3:40 p.m.
Donald Trump Jr. accepted help from what was described to him as a Russian government effort to aid his father’s campaign with damaging information about Hillary Clinton, according to emails he released publicly on July 11,2017. President Donald Trump’s eldest son, Donald Jr., at the Republican National Convention July 19, 2016. After months of denial by the Trump team about communication with Russia during the 2016 election, Donald Trump Jr. confirmed he met with a Russian lawyer in hopes of receiving damaging information on Hillary Clinton. Would such a meeting be illegal? Most experts we talked to said at the very least it raises serious concerns about whether U.S. federal election law was broken. But they also cautioned that the factual record is still developing. Here’s what we know so far: according to an email chain Trump Jr. published on Twitter, the meeting was set in motion June 3, 2016, when Trump Jr. received an email from Rob Goldstone, a business associate of then-candidate Donald Trump. Their correspondence would eventually culminate in a June 9, 2016, meeting at Trump Tower between Trump Jr. and Natalia Veselnitskaya, who Goldstone at one point described in an email as a "Russian government attorney." Trump Jr. forwarded the email chain to then-campaign chairman Paul Manafort and the elder Trump’s son-in-law Jared Kushner, who also attended the meeting with Veselnitskaya. Veselnitskaya has represented Russian state-owned businesses and the son of a senior government official, according to the New York Times, which broke the story. But in an interview with NBC today, she denied having ever worked for the Russian government. Both Trump Jr. and Veselnitskaya have said she did not hand over sensitive information on Clinton, and that the meeting’s focus turned to U.S. sanctions on Russia and related matters. "Her statements were vague, ambiguous and made no sense," Trump Jr. said in July 9, 2017, statement. "No details or supporting information was provided or even offered. It quickly became clear that she had no meaningful information." However, Veselnitskaya said Trump Jr. and the campaign officials eagerly sought the information during their encounter. "It's quite possible that maybe they were looking for such information, they wanted it so badly," she said through a translator. In a press briefing after Trump Jr. posted his email chain, White House spokeswoman Sarah Huckabee Sanders read the following statement from President Trump: "My son is a high-quality person and I applaud his transparency." While experts cautioned against drawing any hard legal conclusions at this early stage, they said the circumstances surrounding the meeting between members of Trump’s inner circle and the Russian attorney could potentially violate U.S. federal election law. "If the meeting is as described, it would raise serious issues of liability under laws restricting foreign participation and influence in American elections," said Samuel Issacharoff, a professor at New York University School of Law. Federal law prohibits a foreign national from giving anything of value to a campaign engaged in a U.S. election. It’s also a crime to solicit a foreign national to do so, or even to "knowingly provide substantial assistance" in receiving something of value. While illegal foreign contributions typically take the form of money, legal experts told us it’s possible a court could find that "information" satisfies the legal requirement if it’s considered valuable to a campaign. "Contributions definitely do not need to be in the form of cash to constitute a thing of value," said Michael S. Kang, a law professor at Emory University Law School. "However, it also needs to be said that this is an unusual situation quite unlike the usual context for an illegal foreign contribution, typically in the form of money rather than information." Additional legally significant questions remain unanswered, experts said, including whether the younger Trump engaged in these actions "knowingly." However, some experts noted that recently-surfaced facts substantially flesh out the evidence needed to show intent. "The tweeted emails make things worse for Trump Jr.," said Michael Gerhardt, a professor at UNC School of Law. "He looks now as if he attended the meeting with not only his eyes open but also to acquire information -- something of value -- in violation of federal law." Yet even if enough facts emerge that touch on all the technical elements of the law, the question of whether or not a prosecutor takes up the case is a separate matter entirely. "It could end up a different thing to establish a sufficiently clear case, factually and legally, to justify prosecution," Kang said. But he later added, "the email chain begins to fill in gaps about the factual record."